I’m not normally a gadget person in the kitchen. Sure I like to save time like everyone else but rather than some whizzy gizmo for peeling garlic for example, I prefer to get stuck in and peel it with my fingers. Having said that I do use a few machines to help get big jobs done quicker. My KitchenAid mixer, my Magimix processor, juicer and ice cream maker and my cheapo-I-don’t-know-which-brand-it-is spice grinder. 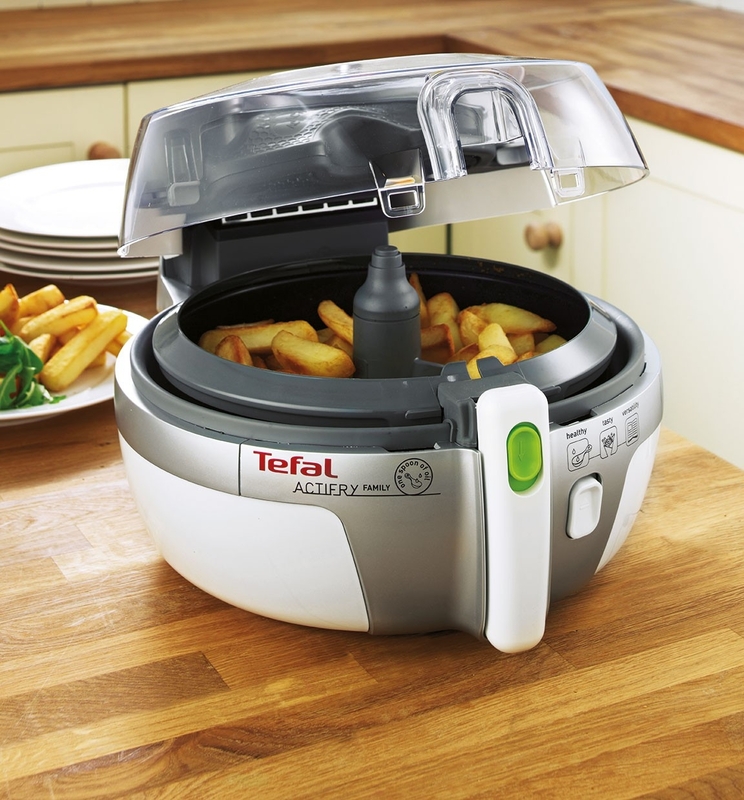 But I have never had a gadget that saves time and helps me stay healthy so when the team at Tefal asked me to try out an Actifry, I accepted the challenge. Essentially there are no functions. This is good. I like simple machines where I don’t have to spend hours poring over the manual. I was sent the large family machine. It slotted in nicely alongside my other machines. The uncooked food goes into the ‘pan’ and around the stirring paddle. 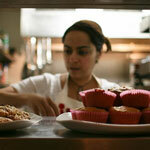 Then the patented hot air system cooks the food while the timer leaves you free to get on with other work. There is a transparent window that you can peep into to ensure the food is not over cooking. The great thing about it is that it doesn’t steam up because there is no steam. It’s dry air cooking the food. 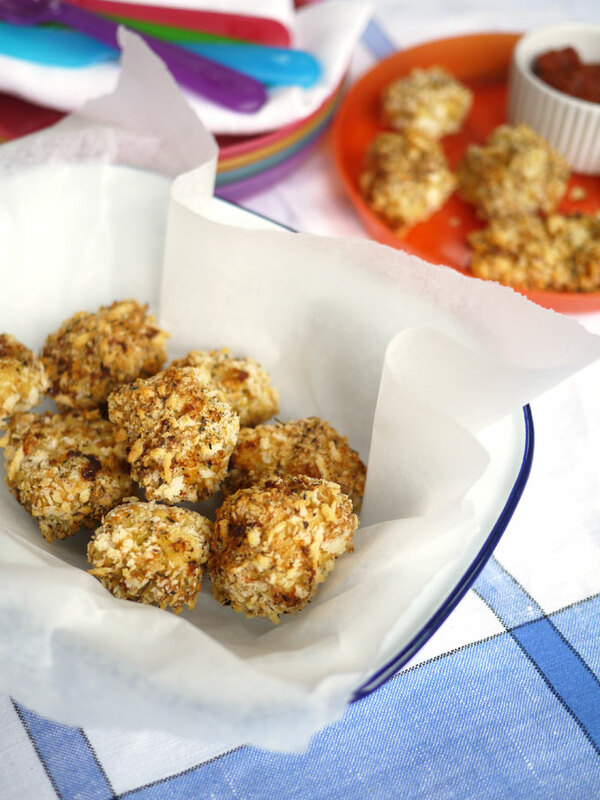 I experimented first making these Parmesan Crusted Chicken Bites by Sarah at Taming Twins for my girls. Actually the girls made them as they were so easy and the Actifry is so simple to use. We ate these with sweet potato wedges also made in the Actifry and a creme fraiche dip. The girls barely spoke as they wolfed these down. Thank you to Sarah for making my first time cooking chicken barely traumatic at all! We made a similar recipe using prawns – Mince about 250g raw prawns with three spring onions and chilli flakes to suit your tastebuds, roll in flour, egg and panko breadcrumbs as Sarah does in her recipe and again cook in the Actifry for about 25 minutes til golden brown. I then set about making breakfast. I love granola and experimenting with different pairings but it’s a little time consuming to bake. The Actifry made it in 8 minutes. It was properly crunchy and I used far less oil that I would normally. I absolutely loved the results and for this alone the Actifry has been amazing. Put the oats, nuts, maple syrup, vanilla extract and oil in a large bowl and toss together so everything is evenly mixed. Put the mixture in the Actifry, set the timer for 7 minutes, close the lid and leave it to cook. Add the chopped dried fruit and then set the timer for another minute. That’s it. Done. 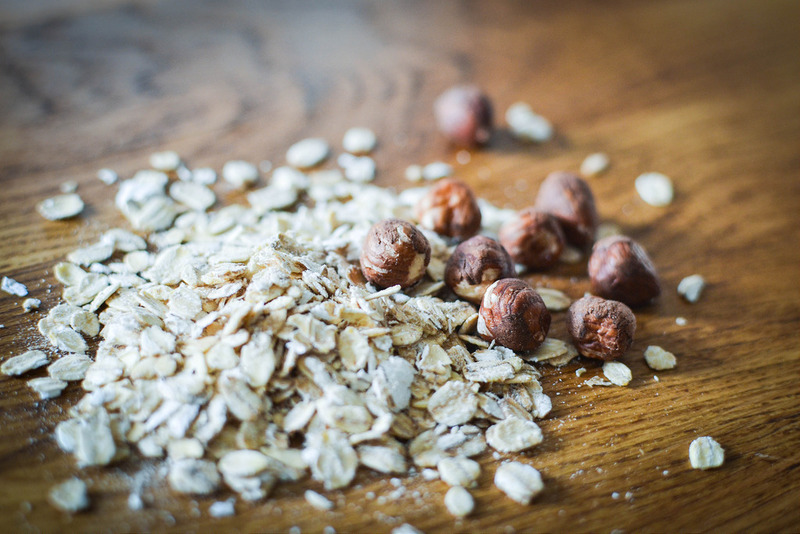 I love the simplicity of the ingredients used in granola. What variations do you make? I love the idea of apple and cinnamon granola. It’s also a much healthier sweetener than maple syrup! I’ve had an actifry for two years. They don’t come out crispy but we eat the fries in the South African “slap chip” way. Basically you take the fries out, put them in a bowl, and pour in a little vinegar, some salt, and some paprika and cayenne pepper. They are really good this way. I’ve even put them on pizza with polony and cheese and that was amazing. And totally unhealthy. I will say that the actifry says you’re supposed to individually dry each piece before cooking them. I did that exactly once time and then the next time I said “ain’t nobody got time for that” and just threw them in wet from rinsing. I let the actifry run for about 4 minutes, then stopped it and added my oil and salt. They came out exactly the same. ON pizza??! I am liking that! I’m not a gadget person either (mainly because I no longer have the room for them) but this Actifry looks interesting. Of course I automatically associated it with chips when it first came out, so pretty much ignored it. But you have shown how versatile it is. That granola looks smashing! I know some others who have used it for chips but I don’t eat chips that often. The wedges were food but I make them with very little oil in the oven anyway so I think it’s the more unusual uses I have found more intriguing. It makes good compote too for example. Or stewed apples. It is really versatile. I roast chicken pieces, nuts, and even bake cookies in it. Baby potatoes come out great in it as well. I am intrigued about how you bake cookies in it! This looks fantastic – what a great gadget! How interesting! I love using cinnamon and coconut! Oh yes that’s a winning combo. 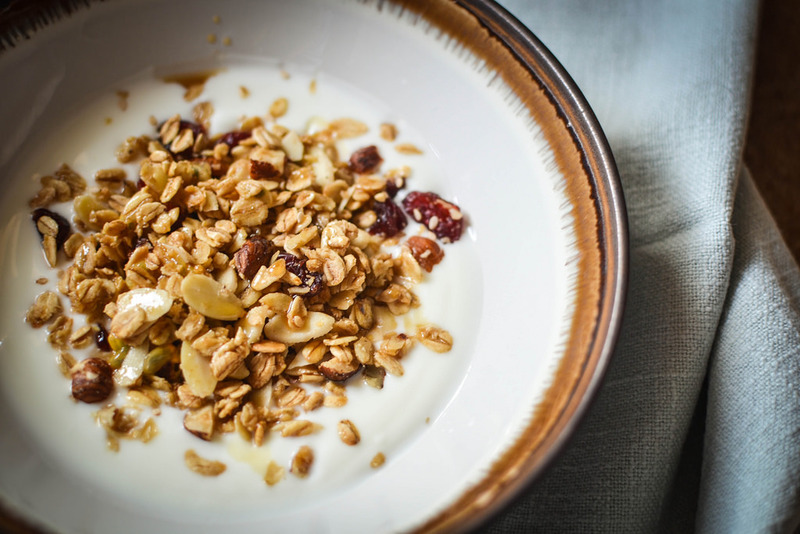 Love the idea of making this granola. I’ll have a go in my Philips Airfryer . Umm. Had my actifry since xmas and definitely an amazing gadget. Have used it for tegular chips, sweet potato chips, mushrooms etc. Tried granola and the oats acted like pop corn. As the lid doesn’t seal it is everywhere! What a mess to clear up. Will be back to the baking tray and oven next time. That’s strange. I’ve never had that before? I can only conclude the oats were dry. Did you coat everything evenly in the oil and syrup? Also I have never had anything come out under the lid before. Very strange!